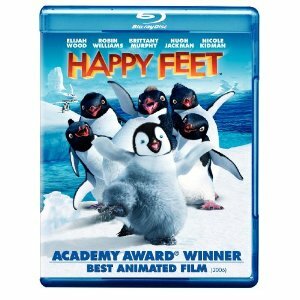 WorldMovieStore - Happy Feet Sinopsis. Happy Feet is an animated wonder about a penguin named Mumble who can't sing, but can dance up a storm. George Miller, the driving force behind the Babe (and Mad Max) movies, takes another creative step in family entertainment with this big, beautiful, music-fueled film that will have kids and their parents dancing in the streets. From his first moment alive, Mumble (voiced Elijah Woods) feels the beat and can't stop dancing. --Doug Thomas. Read More Sinopsis. 0 Response to "Blu-ray Release Happy Feet"